Sacred Scripture begins with the creation and union of man and woman and ends with “the wedding feast of the Lamb” (Rev 19:7, 9). 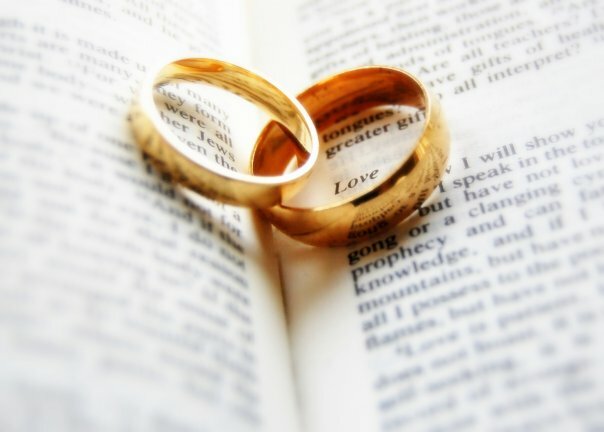 Scripture often refers to marriage, its origin and purpose, the meaning God gave to it, and its renewal in the covenant made by Jesus with his Church. God created man and woman out of love and commanded them to imitate his love in their relations with each other. Man and woman were created for each other. “It is not good that the man should be alone. I will make a suitable partner for him. . . . The two of them become one body” (Gn 2:18; 24). What a joyful and exciting time in the life of a couple, preparing to say “Yes” to each other forever before God in marriage. During your time of dating, you probably had many heart to heart conversations about many things. Now that you’ve taken a definitive step toward becoming husband and wife in the sacrament of marriage, it’s important to revisit, or maybe visit for the first time, topics that will impact your lives together. Please visit this US Conference of Catholic Bishop’s website full of wonderful resources for engagaed couples: www.foryourmarriage.org. IMPORTANT NOTICE: BEFORE BOOKING YOUR RECEPTION OR CALLING TO BOOK YOUR WEDDING DATE, PLEASE CONTACT ONE OF OUR PARISH PRIESTS OR DEACONS ATLEAST SIX MONTHS BEFORE YOU HOPE TO MARRY!